Annemarie lives in Copenhagen, Denmark. It is 1943. Her best friend, Ellen Rosen, is Jewish. This is a beautifully told story appropriate for fourth graders. It is sweet in it’s own way, and pulse-poundingly adventurous, though not in a way I’d ever want to experience for myself. It is a deadly serious look at how Nazi occupation changed the lives of so many people. Though I’ve read this book a half dozen times now, every time I like it more. It won the Newbery in 1990. It would have won the Squeaky Award as well but for two OMGs and one mild profanity. “How brave are you, little Annemarie?” he (Uncle Henrik) asks suddenly. She was startled and dismayed. It was a question she did not want to be asked. When she asked it of herself, she did not like her own answer. That time does come. Annemarie never thought it would. Copenhagen, though German soldiers stand on every corner and pink-frosted cupcakes are a thing of the past, still seems like a safe place. Even after occupation, King Christian continued to ride his horse, Jubilee, through the streets and the Danes remain fiercely loyal to him. They would give their lives to protect him. “All of Denmark is his bodyguard.” But one day soldiers do come come after Jewish families like Ellen’s, and Annemarie is called on to be very, very brave. Number the Stars is a remarkable book that should certainly be read with a pink-frosted cupcake in honor of all those who found the courage to stand against the Nazi regime. I read Number the Stars with my boys as part of a social studies curriculum in conjunction with two other books of note that I would like to mention. The first is an adaptation of The Diary of Anne Frank which is appropriate for a young audience. It’s called Anne Frank, written by Susanna Davidson, and put out by Scholastic. Though only 65 pages in length, it is extremely well done and filled with real pictures, timelines and facts. There also happens to be an excellent BBC dramatization of the original title that streams on Netflix. It’s done in a series of five half hour segments. 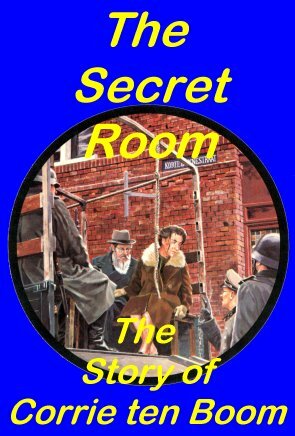 The second book is called The Secret Room and is available through Amazon, but it’s also free online. It’s a condensed version of The Hiding Place, by Corrie Ten Boom. Religious in nature, it’s the powerful story of a Dutch family who hides Jews in their home and is discovered the the secret police. It tells of the time Corrie and her sister spend in a concentration camp, but it is written at a child’s emotional level. There is a movie called The Hiding Place, which we watched as well. It was made in the late 70’s, I believe, and is a bit slow in places, but it’s another visual tool to help kids learn about this period in history. All three books and both movies are appropriate for age 9+. In fact, my seven-year-old listened in. There’s a new Holocaust book by Alan Gratz that is available on Netgalley. It doesn’t come out until March, but it was excellent; Prisoner B-3087. I use Number the Stars for students who are too disturbed by books about camps. Thanks, Ms. Yingling. I’ll check it out. I would like to check these books out. Mom got me “Anne Frank” and I liked learning about her life. I think it’s important for kids to learn about the Holocaust even if it is a hard subject. Where’s the local library around here?!? (we just moved last week on Sunday. There is no local book store, but they have a public library)! This is truly a classic novel. And one adults should read if they have not. I had the distinct pleasure of hearing Lois Lowry speak at a local bookstore over a year ago. Man, is she wise–about writing, about life, about living life. Agreed! (About adults reading it.) I would love to hear Ms. Lowry. If she ever pops up ’round these parts, I’ll be there. I was just thinking about Anne Frank recently, on her birthday. Thumbing back through the pages, I was just as amazed by her unbelievable voice and presence as I was the first time I read it/ I’ll have to add Number the Stars to my TBR list. Thanks! She was an amazing child. Her story is so sobering, but I can’t think of a better way to prevent other voices from being silenced than by reading and sharing hers. These books are important for children to read and I am glad to hear they are being used in schools. One I just read is “Making Bombs for Hitler” by Forchuk Skryuch which I also thought was quite good. I’ve heard of it. I’ll look that one up, too. Thanks, Darlene! I read everything I can find about the holocaust, mostly adults novels and autobiographies. But, I’m not familiar with this child’s book. Looks like one to dd to my list. The Boy in the Striped Pajamas was a real tough read. I think it is important that we introduce children to what is and has happened in the world. Great review. My local librarian just recommended that one to me. It’s on my summer tbr list.